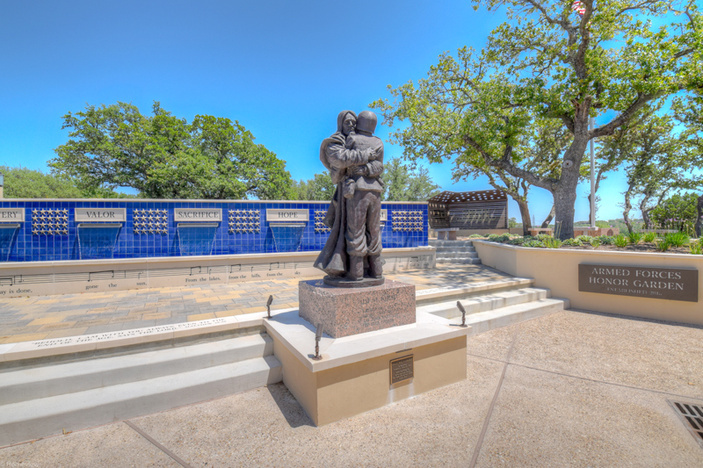 HORSESHOE BAY — If you’re looking for a special way to pay homage to veterans as well as those who currently serve in our nation’s military this Fourth of July, plan to attend the dedication of the Armed Forces Honor Garden at St. Paul the Apostle Catholic Church. The Honor Garden — under construction for the past three years — is now complete, and the public is invited to attend its formal dedication July 4 at the church, 201 Dalton Circle. The special event begins with Mass at 5:30 p.m. The dedication ceremony will take place at 6:15 p.m. After the dedication, there will be a reception with refreshments in the adjacent Linda Finn Family Life Center. Along with its centerpiece statue of Jesus Christ embracing a soldier, the garden features a large fountain lined with blue tiles that are studded with brass stars bearing nameplate centers. The nameplates memorialize donors’ family members who have died in battle or those who are now deceased after serving in the military. A metal wall at the back of the garden contains memorial plaques honoring those who have served or are still serving the country. Paving stones in the garden’s walkways pay tribute to the efforts of those who have contributed to the garden’s development. Adding to the garden’s military theme, the fountain’s base is inscribed with the words and musical score of “Taps.” The garden also includes a peaceful upper area lined with stone benches, and several of its walkways are inscribed with inspirational scripture passages. Designed by landscape architects Studio | 16:19 of Round Rock and constructed by Westway Custom Builders of Horseshoe Bay, the $230,000 cost of the garden was completely funded with donations from St. Paul’s parishioners as well as many other residents in the community. The memorial Honor Garden was the idea of the Rev. Ruben Patiño of St. Paul's. As a teenager, he was a member of the American Junior GI Forum in Corpus Christi. Among Patiño's most poignant memories is being part of an honor guard that welcomed home fallen American soldiers as they arrived from Vietnam at the Corpus Christi airport. He accompanied the honor guard as they escorted the bodies to the soldiers’ families in the small rural towns of South Texas. Years later, as a seminary student in Washington, D.C., he was reminded of his honor guard experience as he walked the path of the Vietnam War Memorial Wall. The thousands of names inscribed on that wall were overwhelming to him, especially when he realized that among them was the name of his stepbrother, Robert Patiño. In 2014, a couple who had been married at St. Paul’s donated to the parish a life-size statue of Jesus Christ embracing a soldier. Titled “Lest We Forget,” the statue inspired the father to begin developing the idea for what was to become the Armed Forces Honor Garden. “The fight to preserve freedom and our American way of life, at times, calls on our loved ones in the military to go against their Christian values,” Patiño said. “In some cases, they are required to take lives or witness the taking of lives. When they return home, among their primary needs are reconciliation and a sense of inner peace as bridges back to everyday life. “I wanted to create a space dedicated to those needs. The statue provides the right message for such a space, one that inspires rebuilding a sense of forgiveness and inner peace,” he explained. He added that the garden is designed to also be a place that reminds us of the selfless sacrifice of those who serve. And it continues to offer opportunities for individuals to recognize family members and friends who have served or are currently serving. Finally, it serves not only as a contemplative garden but also as a permanent display that honors the sacrifices of our true American heroes, Patiño said. For more information on Armed Forces Honor Garden memorials and sponsorships, call St. Paul’s parish office at (830) 598-8342.